Chalkboard here from Chalkboard War, back after a bit of a break to talk more Warmachine and Hordes. This time I want to discuss a few of the lists that are appearing at the 2018 World Team Championships for Warmachine and Hordes. The event this year is September 14-16 in Warsaw, Poland. A lot has already been said in podcasts and social media about the trends at the event. Yes, there’s a notable glut of Slayer spam in Cryx. And yes, there’s a dip that CID cycles seem to have on faction representation (see Khador and Retribution). But in this article I want to talk about some lists that surprised me when reviewing the different teams. I’ve singled out three lists that surprised for different reasons. Each of them are with a Warmachine warcaster or Hordes warlock who appears only once at the WTC. My hope is that spending a bit of time ruminating on each of them will help provoke some discussion about the big questions of the world meta, local metas, and the 5 player team model for events. Iron Mother: Why Aren’t There More of Her? In this instance, the list has some innovations that make it a bit different than the classic Mother list. Because of her Feat, the Fire Group spell, and her Field Marshal [Arc Node] ability I’ve seen more lists that were a bit more battlegroup heavy. However, the lure of dual Battle Engines is strong in Convergence. This list centers around the Prime Axiom, a couple of Mitigators, the two TEPs, and the swarm of Elimination Servitors. It’s a strong ranged presence made stronger by Mother’s kit. Tactical Supremacy really helps battle engines, while the reach of the Axiom with Fire Group is always a central worry for foes. The Elimination Servitors turn up the threat even more against most Warmachine factions. Her Backlash spell can easily put some scare into Warcasters. What really surprises me about this Mother list is that there is only one of them in the entire field. Part of it might be the desire to run Locke with Convergence, and the continued effectiveness of Axis. But Mother offers a really scary look against Warmachine factions. 13 inch range tow cables, TEPs to take out infantry or still punch armor as needed, and the perpetual Backlash threat are a scary combo. Most teams could count on Cryx, Mercs, Cygnar, and Protectorate to be well-represented for this event. Given that, I would think Iron Mother could have been a more frequent choice. The drawback may be that she doesn’t have enough “oomph” to stop the most common Warmachine list (Gaspy3 Slayer Spam). 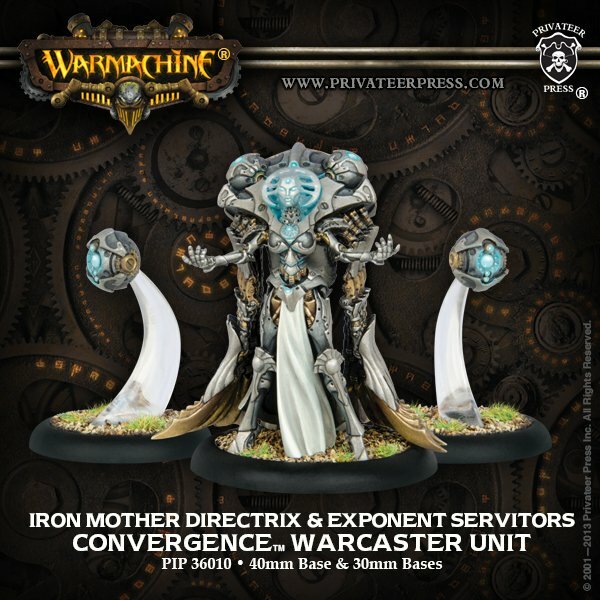 Still, I’m surprised that in an event where you can control some matchups and expect plenty of Warmachine, that Iron Mother isn’t as popular as others. This list is somewhat surprising compared to what I’ve seen elsewhere. Running Kraye with a heavy battlegroup to exploit his bonuses to Warjacks is reasonably common. This one is a bit more shooty than some I’ve seen. A Thunderhead and Centurion are joined by three Chargers and two Minutemen. It still keeps that great threat of being able to fling out Warjacks at extreme ranges. It can stand off and shoot until the time is right, and then get some nasty depth of threat. Expect a fair number of assassinations with this list. Opponents will need to get forward to engage, then find some bursts of shooting on Feat turn open the door to putting a heavy right into the face of a warcaster/warlock. Even shooty warjacks get scary when they’re getting impact attacks and boosted charge attack rolls (as Cavalry). What’s more interesting than the list, is the rarity of Kraye as a warcaster at the WTC. He has a lot of flexibility, can get a ton out of his lists, and runs a style that pairs well with some of the other great Cygnar warcasters. 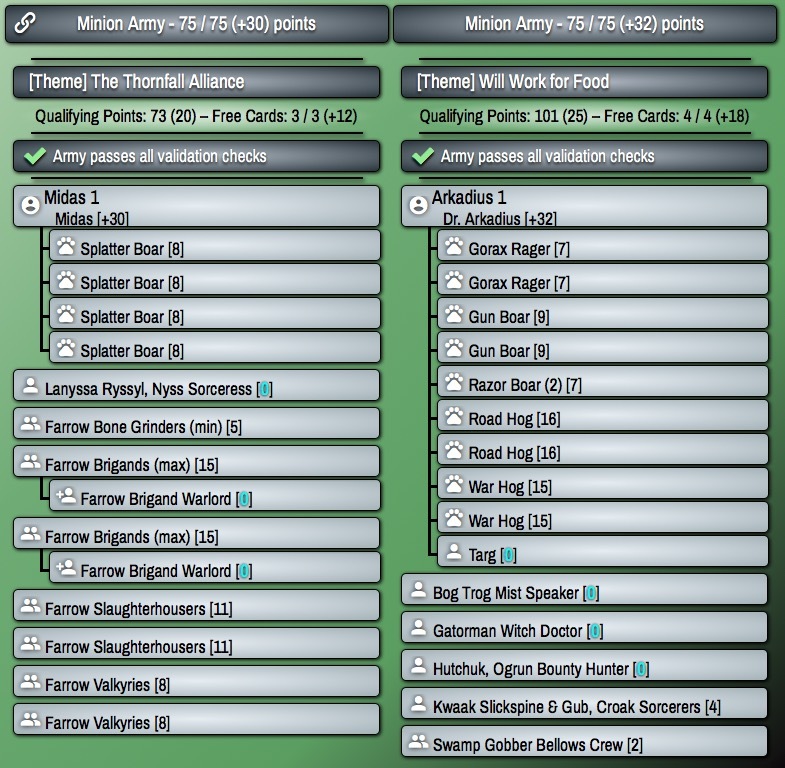 It’s clear that for whatever reason, despite being a warcaster with a lot of depth, options, and capability, he’s still B-List for purposes of this event. It’s likely scenario considerations that are holding him down, though this version of the list, with the heavy shooting, may answer that somewhat. 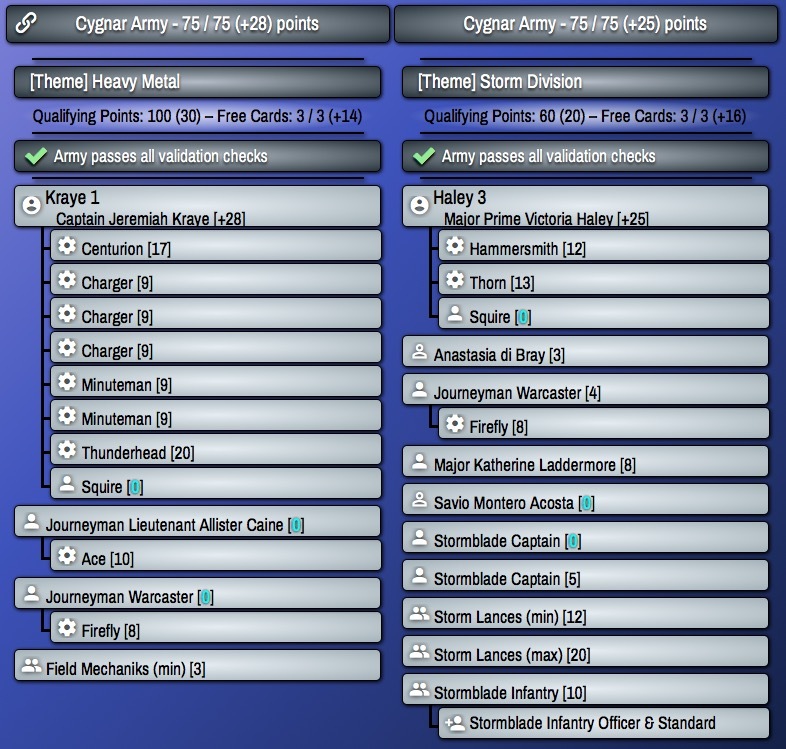 I think this shows the depth of Cygnar options more than anything else. In Andy’s case, it’s paired with a Haley3 list that is likely to see much of the play—reserving the Kraye for those moments where the matchup to that list is poor. Yet Brisbane2, Nemo3, Haley2, and Sloan are all warcasters with serious upsides in a team tournament, and who pair nicely with Haley3 and each other as needed (as only a little above 50% of Cygnar players have Haley3 in their pairing). 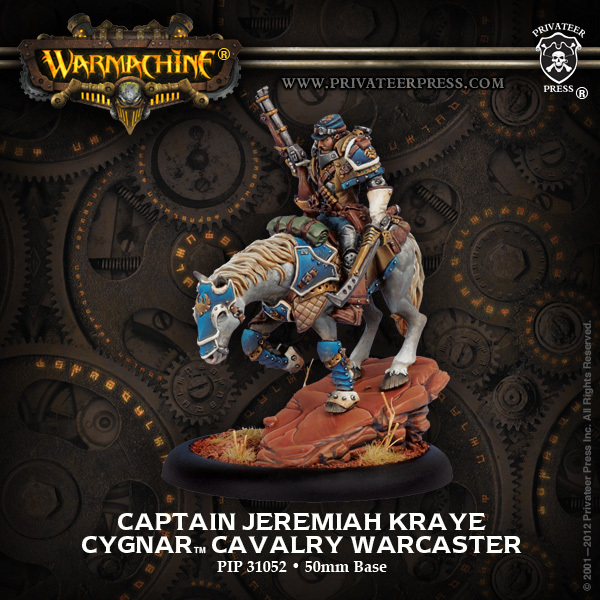 For Kraye to see so little representation, it’s a sign of how strong the top Cygnar options are in terms of pairing strength. Okay, so this list just jumped out at me simply by not being familiar with it. 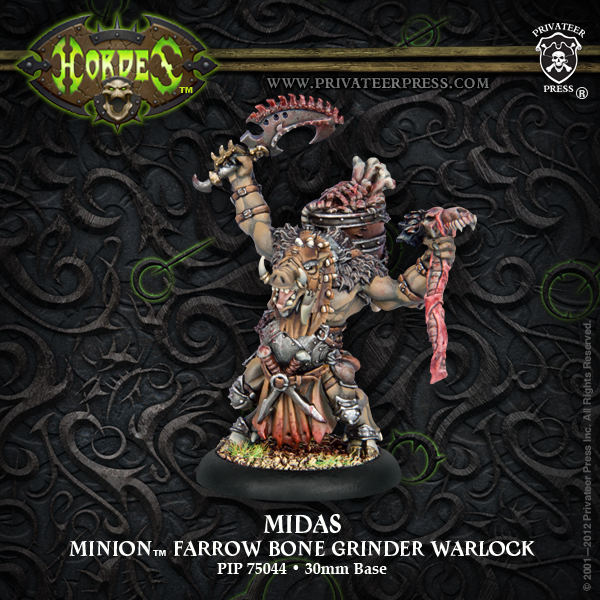 Midas with four Splatter Boars as his battlegroup, then heaps of Farrow infantry (double Brigands, double Slaughterhousers, double Valkyries). The more I looked at it, the more I really like it. I especially like the pairing with the nastiness that is Liam’s Dr. Arkadius list. This one has some serious tools. The all Splatter Boar battlegroup was a puzzler at first, but then I started to think about what’s out there. Corrosion on hit rather than direct hit, plus the Alchemical Mask ability, helps this list put the hurt on cloud walls and infantry. It gives some nasty control difficulties against Hordes factions as well thanks to the Psychoactive Gas ability. I tend to look to the battlegroup for the heavy hitter, but that isn’t the case with this list. It’s all the infantry that does the destruction. The Slaughterhousers combined with Midas’ Battle Lust can hit like trucks, and the other infantry certainly does work with the spell as well. The Valkyries are surprisingly durable, and Shield Guard plus Vengeance makes for strong scenario presence. This isn’t a list that’s going to get behind too fast in many cases, and that means dealing with the herds of Battle Lust-ed Farrow while coping with the disruption the Battlegroup provides. What surprises about this list is how nasty it looks in a team event setting. Teams cannot take this list lightly, as it has the tools to put out serious hurt to some of the most common archtypes across lists right now. Lots of slayers? Cloud walls with infantry? Grymkin and Trollbloods beast bricks? Medium-based infantry like Primal Terrors? This list gives all of those at least a run for their money. Not only that, but again it benefits from the threat of the Dr. Arkadius list as the alternative (great hard-to-predict threat angles plus raw destructive force). 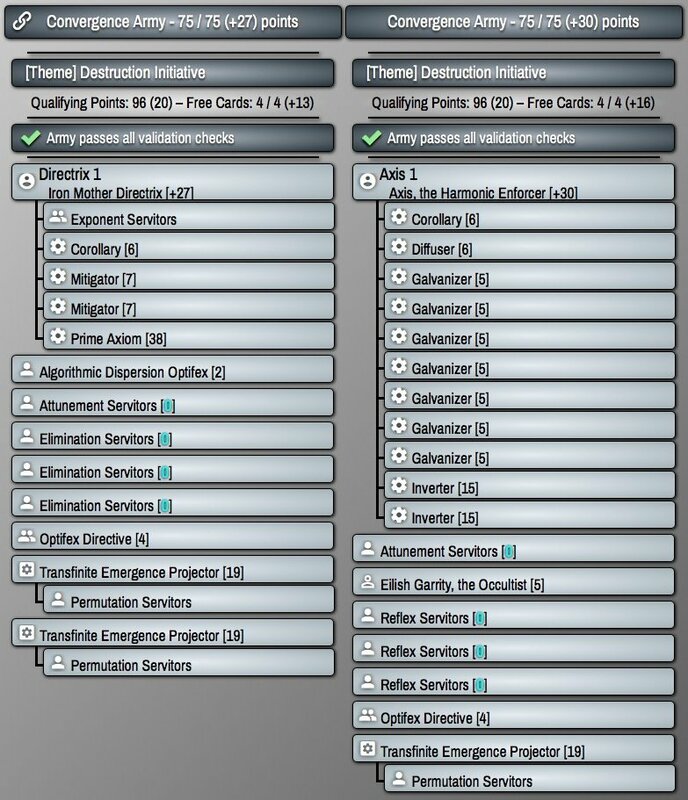 In the team setting, it can be a confident drop on either side (active or reactive), and by leveraging somewhat rarer tools, it gets a bit of a Dark Horse vibe. Likely other teams will not have practiced against it extensively—and a practice simulation or two may not show the full depth to which this list seems to have answers to lots of questions. ~ What lists surprised you in this 2018 WTC group? Are there other standouts that should be mentioned? Any notable absences? Let us know in the comments section below!